Synopsis: A transformational treatise on hate, greed and war, Legends of the Light Bearer: The story left untold is speculative visionary fiction that weaves politics, religion, ancient mysteries, conspiracy theories, physics, the paranormal and sci-fi into a fast-paced, spiritual thriller. In the months leading up to 9/11, the newly elected Senator from Virginia is drawn into a nightmare that threatens her sanity, and then her life. She uncovers a secret so ancient, so complex and profound that it will take the combined efforts of a NASA scientist, a Biblical scholar, a government spy, a paleontologist and Heaven itself to unravel it. Based on ancient and forbidden scriptures, this is the story you were never meant to hear…until it is too late. Legends of the Light Bearer will challenge everything you thought was true, while offering a startling yet compelling new paradigm: Conspiracies and the supernatural are the only true reality, opposing forces in a spiritual war that uses humans as pawns on a chessboard. It is not mere happenstance that we find ourselves on the brink of extinction; economically, environmentally, or in terms of our inhumanity to one another. It is by design. And the one little thing they do not want you to know is that we have the power to defeat them. My Thoughts: When L. M. Aldrich contacted me, requesting a book review, I was thoroughly excited. This is only the second time an author has asked me to review her book, and I am eager to share my thoughts. 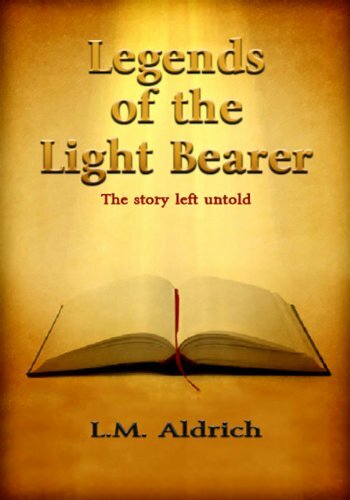 When I read a synopsis of Legends of the Light Bearer, my anticipation increased dramatically, for the topic of this novel is one I am greatly interested in. I hope I can harness the power of words once again as I try to justify the evident uniqueness and greatness of this book. Legends of the Light Bearer: The story left untold is an intriguing novel comprised of government conspiracies, possibilities of extraterrestrial existence on Earth, and religious mysteries. The combination of these aspects makes for an intricate and enthralling plot. It is evident that the extensive research required for this story was in-depth. The obvious passion L. M. Aldrich put into her work is highly commendable and shines throughout her writing. I believe L. M. Aldrich was hinting at something while writing this book. A curious theme seems to crop up in every corner of the plot and encompasses the entirety of the text; salvation can only be found in the true light of God. Spiritual enlightenment cannot be found in the realm of matter and earthly pleasures, only in the omnipresent spirit of the universe where true love resides. I hope I have not completely missed the point of the novel, as that would be embarrassing. This is what I received from reading the book and what I found truly beautiful. Synopsis: Welcome to high school high society hell, where last season’s slingbacks can warrant a lunch table demotion, the wrong date will knock you off the it-list and behind every pair of oversized Chanel sunglasses lies a secret people are dying to keep. As if senior year at Weatherford Preparatory School wasn’t hard enough, sixteen year old Alexis Bardolph had to add school outcast to the curriculum. A new found notoriety following a family scandal, her lacrosse star boy-friend dumping her for a former BFF and a string of perpetually bad hair days were among the many things going wrong in her already turbulent teenage life. But when the haunting nightmares that have plagued her since childhood begin to take an eerily tangible form and several Holler Creek residents are reported missing, Alexis can’t help but wonder if there isn’t more to her hellish dreams than meets the eye. The unexpected arrival of a mysterious and dangerously handsome new student ultimately leads Alexis to troubling truths that not even her wildest imagination could have conjured. Review: I was greatly excited when J.D. Thompson requested I review her newly released YA. Paranormal romance is not a genre I generally read, but it was enjoyable nonetheless. Silver and Stone is an absolute fun book to read, worthy of being praised alongside the best of young-adult fiction. I finished it in less than a day, and surprisingly found it to my liking. The flow of the plot from one moment to the next was superb, and the chapters were divided excellently. You would be hard-pressed to experience boredom while enveloping yourself in this fascinating story. Of course, without in-depth characters a plot would get nowhere. Luckily, J.D. Thompson’s novel seems to be in plentiful abundance of such personae. She cleverly works strands of dialogue to bring the most out of her characters and is most adept at describing the emotions they feel while interacting with their environment. Thompson is definitely an author that knows what she’s doing. 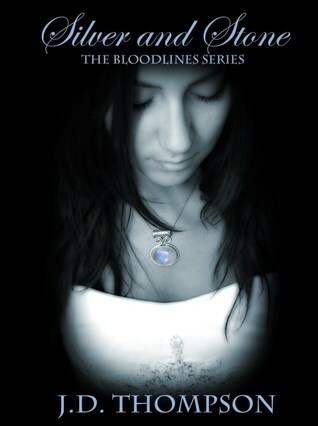 Overall, I recommend the beginning of The Bloodlines series to the majority of paranormal romance lovers. This spectacular debut is dark, shocking, and provokingly hot! Thompson, J.D. (2011) Silver and Stone.